I’m never quite sure what to bring when someone asks me to contribute an appetizer to an event. I love making dips, but sometimes they clash with whatever is being served and I really wanted to make something that would look lovely, taste wonderful, and take advantage of the fresh tomatoes of the season. Enter, the Caprese Salad! Of course, since I was taking the dish to a fellow wine-friend’s home, I was going to need to incorporate wine somewhere, so I tried to find a recipe that would fit all the necessary categories. 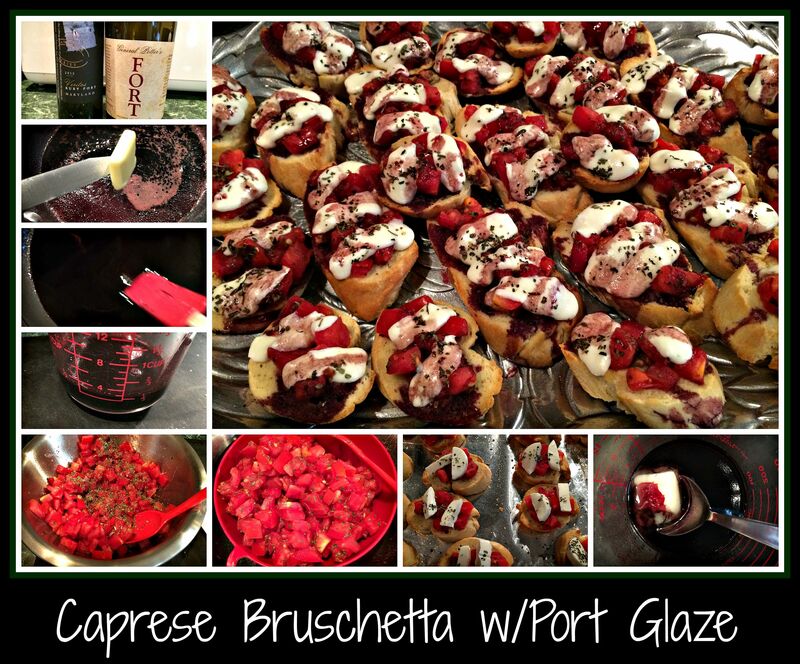 Finding a few ideas on the web, I set to work creating a Toasted Caprese Salad on Bruschetta with a Port Wine Glaze. I made the Port Wine Glaze first, since it would be need time to rest and thicken. Pour the 2 cups of port into a sauce pan and simmer the wine until it is reduced to 1/2 cup. You can tell it has thickened enough if you can see a faint/quick line after drawing a spatula through the sauce from top to bottom. Add a small tab of butter to “gloss the sauce” and adjust seasonings using a pinch of salt/sugar as needed. Set aside and allow to cool to room temperature. If you’re making this step a day ahead, keep the glaze in the fridge and warm slightly before using so the butter isn’t solid when spooning it over the bruschetta. Next, make your tomato mixture. I diced two tomatoes fairly fine and then tossed them with salt/pepper and a bit of Pinot Grigio. The tomato was fairly juicy, so just before using it, I placed the mixture into a small colander to drain the excess liquid off to keep the bruschetta from getting soaked. To create your bruschetta, preheat your oven to 450 degrees. Slice the loaves of bread into ~3/4″ pieces (as thick or thin as you like) and layer them onto sheet trays lined with foil. NOTE: Using foil will make the final toasts easier to move to a serving tray. LIghtly brush the top of each piece of bread with olive oil and allow to toast for 5 minutes. Flip the toasts over and brush again with olive oil before toasting the second side for 5 minutes. To assemble, top each toast with a layer of tomato mixture, a sliver or two of mozzarella, and a sprinkle of basil. Once each toast is adequately topped, pop your bruschetta into the oven for a final 5 minute toasting to melt the cheese a bit. When they come out of the oven, spoon the Port Wine Glaze over top of each individual toast, allowing the glaze to pour over the edges and be soaked up by the bread. Serve as quickly as possible – these are best when warm, crispy, and dripping with glaze. NOTE: If you have leftover bruschetta, you can re-toast them the following day to brighten up the flavor. You can also chunk them up and toss them into a salad to create your own version of a Panzanella salad. This is a really beautiful appetizer that is surprisingly simple to make. Adjust or alter things as they appeal to you and your family.. that’s what makes cooking such an adventure! Spray large skillet with cooking spray and heat on medium high setting. Brown ground turkey, using a potato masher to break up the meat into small pieces. NOTE:This is the BEST way to brown meat, in my humble opinion. Add onion and red wine to the meat and cook until the wine is thoroughly incorporated. Add spinach (or any other vegetables you care to add), cook until spinach wilts, then add pasta sauce and bring to a simmer. Remove from heat and set aside. Boil noodles, as directed on package, or immerse them in boiling water until softened. Drain and set aside. Combine the ricotta, mozzarella, egg whites, Italian seasoning, and nutmeg in a medium bowl and set aside. Begin to layer your lasagna together. NOTE: I used a 9×9 pan and a 9×3 pan – normally, I’d simply use a single 9×13 pan. This is where your noodle amounts may vary. I used 11-12 noodles to cover these two pans, but the rest of the ingredients remained the same. I also vary the direction of the noodle placement with each subsequent layer so the finished lasagna holds together well. Start by spooning a bit of the sauce to lightly cover the bottom of your pan(s). Place noodles over the bottom in a single layer. Top with 1/3 sauce mixture, then dollop half of the cheese mixture over the sauce. Repeat noodle, sauce, and cheese layers. Top with noodles and final third of the sauce, then sprinkle with Parmesan. NOTE: If making ahead or freezing lasagna, this is the place to stop. Cover with foil and pop in fridge or freezer, then allow dish to thaw overnight before continuing. Cover and bake lasagna for 45 minutes. Uncover and bake until lasagna is bubbling and cheese is lightly browned. Remove from oven and allow the lasagna to set for 5 minutes before serving. As I mentioned, this is my favorite lasagna recipe. Not only is it easy to make, it has delicious flavor and is a simple way of getting vegetables into your meal without much effort. I like to add a side of garlic toasts to accompany this dish. NOTE: To make garlic toasts, I start with a roll from the freezer (Ciabatta rolls work well for this, as do sub rolls). Slice the frozen roll into bite sized slices and lay them on a foil-lined baking sheet. Spray the slices with cooking spray and sprinkle with garlic salt. When you remove the lasagna from the oven, turn oven off and pop the baking sheet into the hot oven. The toasts will crisp as the oven cools and be ready to eat by the time you finish plating the lasagna. I put the garlic toasts into a wooden serving bowl and pitch the foil… no messy cleanup! 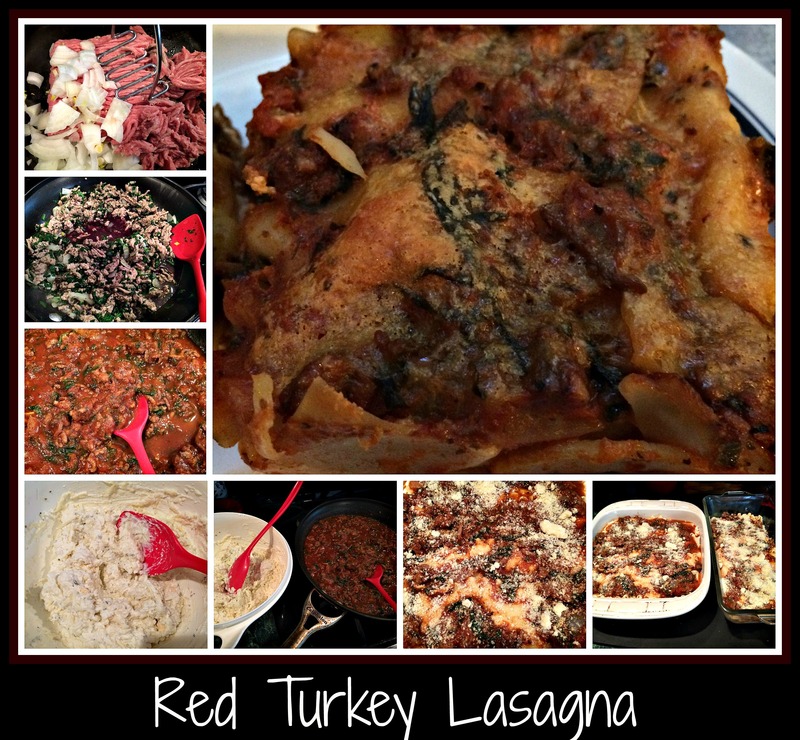 I hope you’ll try this lasagna recipe sometime… it makes an amazing dinner and is always appreciated by my neighbors if I am able to share. Enjoy! Another one of our family “staple” recipes is this easy and simple Mazetti, a recipe that my mother-in-law gave me early in my marriage. Over the years, I’ve adjusted the recipe she gave me to either include lots of “hidden vegetables” or to use whatever quick ingredients I had on hand. NOTE: for those who are interested in the history of the name of this recipe, I would point you toward my friend, Jenna, at The Gleeful Gourmand, who wrote up this version of “Johnny Marzetti“. 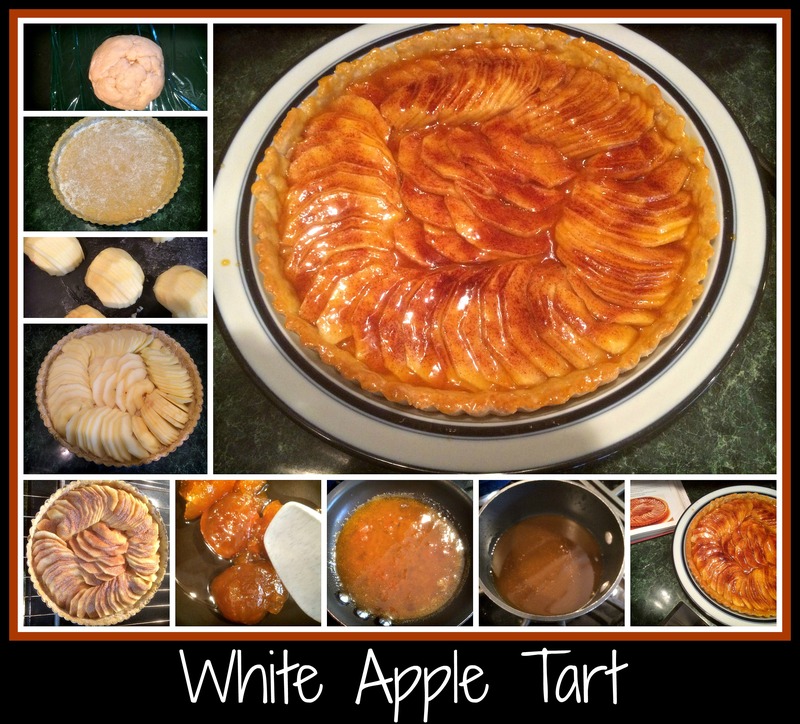 I was fascinated to read the back-story of this great recipe, including her own recipe. 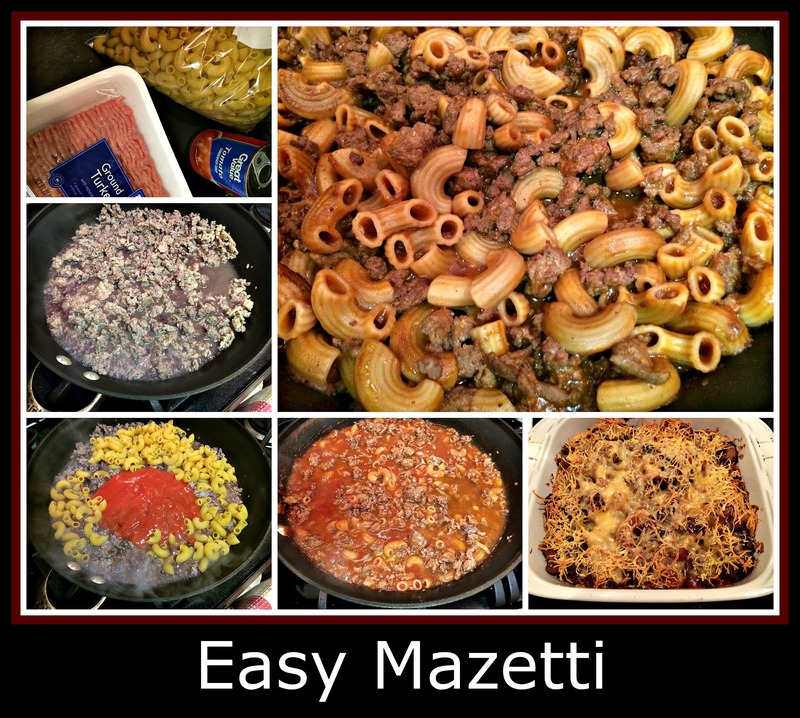 Back to my simple Mazetti… here’s the “down and dirty” of making a quick, hearty meal using just a few ingredients. Brown your ground turkey in a large skillet in a small amount of olive oil or margarine (whatever you have on hand). I also like to add 1/2-1 whole diced onion or some green pepper if I have things on hand and want to stretch the food a bit. I typically will add some red wine and brown the turkey and veggies until the liquid is totally absorbed. Once the turkey is browned and starting to get a bit crispy, add your tomato soup (or soup and water/wine) and your pasta. I really like to use large elbow macaroni, but have used ziti, bow tie pasta, or even small shells… use your favorite pasta shape but don’t use egg noodles as they won’t hold up to the cooking process. NOTE: You are welcome to cook your pasta separately, but I like the way the sauce flavors the pasta pieces. Again, it’s entirely up to you. I enjoy playing with flavors at this point, so I have the unique flavor that I want from each mazetti dish. I have been known to add more red wine at this point, but I’ve also added a shot of espresso (this darkens the flavor considerably), or just some stock or water. If the liquid is absorbed and the pasta isn’t thoroughly cooked, you just need to add more liquid. The pasta will soak up the liquid and become more al dente’… don’t ever give up on the dish as you’re cooking. To serve, you can pop this into a casserole dish, top it with some shredded cheese and warm it up in a 350 degree oven for 20-30 minutes until everything is bubbly. If you’re serving from the skillet, you can either omit the cheese or add it on top just before serving and put the lid on your pan to give the cheese time to melt. 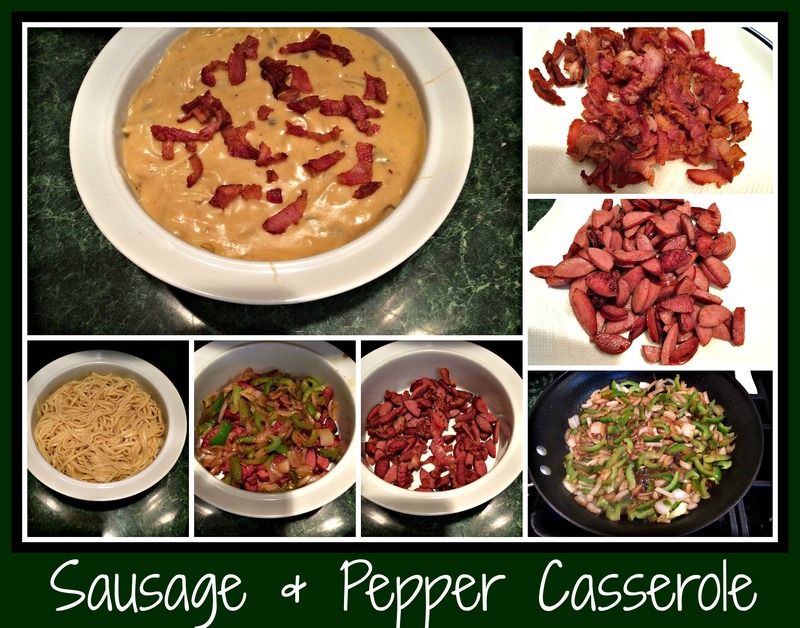 Either way is delicious… my boys have eaten this dish in many different variations and have loved it each time. An extra way to make this dish special is to top it with buttered bread crumbs. I have a recipe for making buttered bread crumbs on my website as a “bonus recipe”, included with “How to make a sauce“. Both of these recipes would qualify as “starter recipes”, so please feel free to check this one out as well. I’ve just added the “starter recipe” tag, so you should be able to find it that way as well. I hope you’ll check out Jenna’s recipe and her history of this recipe… it’s so interesting to find out where recipes originate! Since my Mother-in-Law lives in Michigan and is originally from Rhode Island, her recipe could be a variation of Johnny Marzetti, but it will forever be one of my favorites from her. I was so touched when she shared one of her favorite recipes with me… it always reminds me of her, no matter how I actually end up making the final dish… it’s comfort food to me. It’s the holidays, so this is when I try to take some extended time in the kitchen to play around with recipes… and this holiday season was no exception. I knew that my husband would love it if I could come up with a way to make his favorite breakfast of Cinnamon Rolls, so I started with a basic bread recipe and played from there. The recipe I started with is one that came from The Bread Machine Cookbook by Donna German. This is a link to an Amazon page where you could purchase any of her #1-4 cookbooks… I have cookbooks #1, #2, and #4. She has some amazing recipes and I love looking through her books for inspirations. I found her recipe for a Cinnamon Swirl bread and started from there. Into my bread machine, I put the following, in order: 4 oz water, 1 oz white wine (I used a Pinot Grigio, but you can simply replace this with more water), 1 Tablespoon coconut oil, 1 Tablespoon sugar, 1/2 teaspoon salt, 1 1/2 cup4s flour, and 1 1/2 teaspoons yeast. I then set my machine on the “quick dough” setting and began to collect the remaining ingredients. I warmed some butter (about 4 Tablespoons) in a ramekin and added a dash of salt and a drop or two of vanilla, whisking all together before setting this aside. I then collected about 1/2 cup of brown sugar in a bowl and added a dash of salt, a tiny amount of nutmeg, and a few teaspoons of cinnamon. I tossed this together and set it aside. Preheat your oven to 375 degrees and spray your mini cupcake tin with cooking spray. NOTE: I like to put the pan on a baking sheet covered with foil so I don’t have to worry if the filling cooks over the edge and so it doesn’t drip onto the bottom my oven. I love easy cleanup! I also like to put a small amount of the brown sugar mixture into the bottom of each muffin cup. It’s only about 1/4 teaspoon, but it seems to bake into a yummy topping in the end. Once the bread machine had done it’s work and the dough was ready, I rolled it out on a board, into a large rectangle. Take your vanilla butter and spread it evenly all over the dough. Sprinkle all the spiced brown sugar over top and then begin to roll the dough into a log, length-wise, starting with the area closest to you. Cut the log into 12 even slices and put each slice into a muffin cup. I also like to press the rolls down lightly to push them into their individual cups. 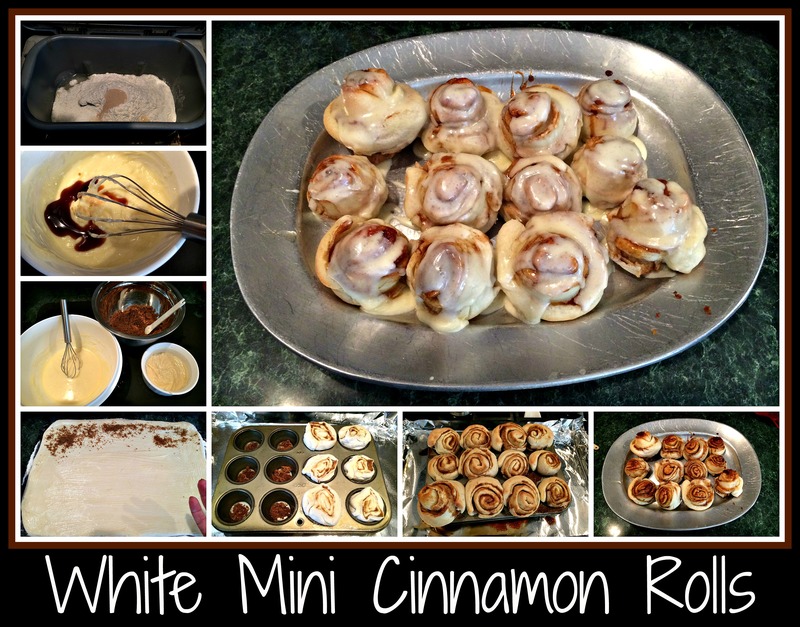 Bake your cinnamon rolls for 17-20 minutes or until the rolls are nicely browned and puffy. While your rolls are baking, you’ll want to make your frosting. You can make yours any way you choose… use a prepared frosting, make a cream cheese frosting, or make something as simple as a blend of butter, milk, and confectioner’s sugar. I added a wedge of laughing cow light cheese to some butter, milk, and confectioner’s sugar… this is where your creativity can have fun. You can add some orange juice instead of the milk if you want a little citrus taste… if you have some evaporated milk left over from a recipe you could use that instead. It’s really all about what tastes good to you. Once the rolls are baked, I like to turn them upside down on a rectangle platter and slather as much frosting as I can load onto these little yummy morsels. You’ll want to serve them warm with milk or coffee… they are fabulous! Wishing you sweet, delicious mornings and a very Happy New Year!